One of the more interesting charts shared was a look at company policy as it relates to social media use during business hours. On average, about 60% of companies polled maintain a “common sense” approach to at-work usage of social media. As MarketingProfs observes however, that an increasing number of companies are banning access to social networks in general. Management often responds to the adoption of social tools the way that public policy has responded to texting while driving: they make it illegal to be social while working. The far-sighted response will be to make it easier to gain the benefits of social business, and to rethink the organization and management of work around human nature instead to persisting in trying to ‘rise above’ what makes us people in the first place. The first will reveal that measuring social media marketing, as practiced to date, is essentially meaningless. Documenting the growth of friends, followers, and fans does not represent loyalty or advocacy. Increased pageviews and clickthroughs doesn’t equate to an increase in revenue, improvement of products and services, nor a reduction or elimination of outdated or inefficient processes. Second, management will grasp the true cost of social media. In 2010, social media will cease to be free. Twitter will offer commercial services, service vendors will offer more sophisticated sCRM (SRM) solutions that will adapt to the new internal infrastructures that will have to be built in order to scale, and there are very real costs associated with human and intellectual capital. 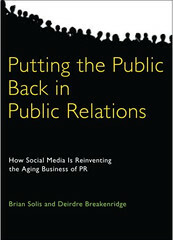 Management will have the prowess in 2010 to measure the cost of a tweet and the expected return on targeted engagement. Third, as the entire organization socializes affected departments, strategists will embrace a holistic and informed approach to engagement. Audits will become standard in 2010, where each team analyzes relevant activity and conversations using the Conversation Prism or similar map as a guide to exploring all social networks and discussion forums. By documenting the frequency, volume, reach, impact, and state over a period of time, brands will amass the intelligence necessary to prioritize networks while also revealing the influential voices within each community. You ask who owns Social Media…your customers, prospects, and influencers define your markets, focus, and attention – where and when they congregate and communicate.